A Google Analytics Project Manager has confirmed the new Google Analytics home screen is now available to 50% of all users. Google was first spotted testing the new home screen design earlier this year. Unlike some other Google tests that come and go, it appears this change is here to stay. There also appears to be a section dedicated to answering the question: “how do you acquire users?” Data within this section includes Traffic Channel, Source/Medium, and Referrals. Check out What A Google Analytics Project Manager said in the tweet! If you don’t yet have access to the new Google Analytics home screen, you can see a preview of it in the screenshot below. When will more users receive access to the new home screen? It’s hard to say at this point, as those being upgraded to the new home screen are being selected at random. If you’re looking for a hot career that combines cutting-edge technology with creativity, then digital marketing is the place to be. Digital marketing recruitment specialists, Forward Role Recruitment has highlighted the most highly sought after roles in digital marketing. CRM Manager– In recent years, CRM (customer relationship management) has become a very popular and cost-effective way of driving greater revenue from customers through their lifecycle. PPC Manager– With Google Shopping driving acquisition in the ecommerce sector, the number of businesses looking to drive more paid digital activity has shot up. As a result, both agency and in-house paid search teams are looking to hire those who know the industry inside out. UX Designer– User experience optimization has been the hot skill set in design for the last few years, with rising demand for designers who can create user-centric web designs that streamline the customer journey. As a result there is a sizeable contract market for people with these skills. Web Analyst– These are the data guys tasked with measuring anything from acquisition ROI (return on investment) right through to conversions. With no clear academic route into this type of role, it is extremely tough to recruit for these positions. CRO Manager– Jobs specializing in conversion rate optimization are a fairly recent thing; focused on optimizing the flow of traffic and conversions through a website. Businesses have become more focused on repairing the holes in their leaky funnels as pouring new customers into the top gets increasingly expensive. Ecommerce Trading Manager– Usually the P&L (profit and loss) owner of a brand, these commercially-minded people are in charge of juggling stock, seasonality, price, promotions, etc. to trade a website to its maximum potential. With many northwest retailers growing into new markets there is a high demand for additional traders. Head of Digital Acquisition– An all-encompassing Digital Acquisition Specialist is not the easiest thing to find. Many of the most recent generation of digital marketers have come through very specific digital channel streams, meaning that a combination of paid, earned and owned skills in one candidate is difficult to locate. Head of Multichannel Marketing– Finding senior marketers with both high-end digital skills and traditional offline marketing experience is challenging. This is because of the generational gap between upcoming digital marketers who have often been focused on specific digital channels, and marketers who climbed the career ladder pre-digital, who conversely may not have hands-on experience with digital. Technical SEO Manager– Another very technical role, with no real academic route. Technical SEO is constantly evolving with every Google algorithm change or new best practice guidelines, so agencies tend to grow their own talent, passing on the secret sauce of their SEO audit onto new generations. PR Manager– With the proliferation of offline and online PR, the traditional PR skill set is in huge demand. Responsibility for link building in SEO and getting noticed online without a paid budget is now laid at the door of Digital PR Managers. Top Digital Marketing Skills You Need to be an expert in 2017 to get High-Paying Digital Marketing Job. There’s a talent gap right now in digital marketing. According to “The Future-Proof Marketer in 2015 & 2016,” a white paper by digital technology training company Grovo, 90% of marketers report suffering from a shortage of digital skills, and only 8% of surveyed companies feel strong in the area of digital marketing. As new technologies, channels, and platforms emerge, the skill sets needed by digital marketing professionals continue to evolve. So, I have covered 9 Top Digital Marketing trends for Freshers in Digital who want to be Digital marketers in 2017. Which do you think will be most important for your business to support growth. Or perhaps there is a trend I haven’t included yet and will update this post. There is room for a 10th? It is not only important to know which analytics tool is your best match, it is also vital to know when to bring in a team to handle the digital analytics. Carefully choosing an efficient team and then assign designated hob to each person will make your work that much easier. For example, your digital marketing manager would be focusing on the metrics of your campaign, like the total number of visits user behaviour, the total number of successful conversions, the number of new visitors visiting your site as well as the number of returning visitors visiting your website, and so on. Your support manager on the other hand, will be more interested in finding out if the visitors who were looking for support were successfully dealt with. Whether all their queries were successfully answered and issues successfully resolved. They would be interested in finding out whether the grievances were met with effectively and how much time did the resolution take. Naturally, each and every person of the team has vital role to play, therefore remember to take time to carefully develop the team and they nurture the team the best you can. Today, data is not limited to just the number of page views. Today’s analytics platforms allow us to go much beyond the simplistic page hit numbers and really provide us a richer and more detailed data and patterns. Visitor segmentation allows you to quickly view the buyer and non-buyer behaviours, categorize contents according to their asset types, measure the consumption of both the gated and ungated consumption which allows you to easily run an in-depth analysis. There are many more ways you can segment your data to gain a more detailed perspective on your visitors. Just find the one that best fits your needs. Gone are the days of focusing on the data based on visits only. Today analytics are more focused on examining the whole user experience and user cycle. Data like where the visitor came from, how they behaved while on your page, what course of action they took while they were on your website, where they spent maximum amount of time, how many resulted in actual conversions and sales and which page resulted in maximum exits, helps you understand your audience better and allows you to tailor your strategies to maintain interactions with your visitors throughout the buying cycle. For the experts out there, generating new leads based on these data is as easy as anything these days. Put into place a strategy that allows you to measure how people behave and interact across the different devices and channels. For example, how a visitor interacts with your business when they come to your site via mobile phones, websites etc. and how they interact with your business overall. You need to be consistently gather, analyse and report data to maximize your success. It is a process that you need to commit to and stick to a list of priorities and a measurement. Go through the data you collect regularly. Be sure that you implement your analytics in-line with the latest changes which comes with the continuous evolving of the websites and mobile apps. Move to automated reporting from manual reporting to maximize your outcome and minimize your frustration. Leverage on data visualization tool like, Tableau, and enable a clear path of insights for your stakeholders. It is quite clear from the above discussion that if you are ignoring web analytics you are missing out on a great deal of conversion rates for your website. If you aren’t using web analytics there is no way on earth of knowing if your marketing strategy is working, whether or not you are moving closer to your desired goal. So don’t fumble in the dark. Choose the web analytics that best suits your goal and sit back and relax. You will shine like a star in no time. Irrespective of the type of website you have, a storefront, an informational or a little-bit-of-both type, web analytics is crucial in determining whether you are achieving your goals or not. Web analytics can also guide you towards your future development and ensure a constant success in all your web strategies. Although internet marketing is much more than just emails, to track the progress of your email marketing strategy, a number of helpful metrics can be provided by your email service provider. The fact that customers have the option of taking numerous other paths to reach your website, paths like search engine results, pop up ads, ads in the forms of banners, links that are found on social media sites, etc., makes it crucial for you to track every bit of your customer’s behaviour to understand what works for you and what doesn’t. You need a tool that lets you track where your web traffic is coming from. What are the kinds of blog posts, the topics, the pages that are diverting the maximum amount of traffic to your website? You also need to know what is the best day and time when traffic is typically the maximum on your website. What are the typical keywords that people type into search engines that drive them to your website? 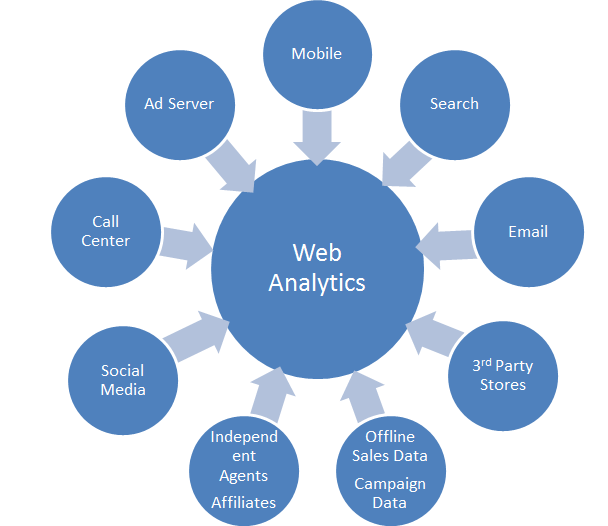 Web analytics tools lets you keep a track on all of this and also how the leads are converting to actual buyers. This information is vital in helping you marketing strategies be a success. The data gathered by web analytics can help you identify and choose the best strategy that works for you, the best day and they best time to leverage maximum success out of your marketing strategies. Web analytics can also help you generate new leads and target new markets that might not have occurred to you otherwise. Ignoring web analytics is like throwing away your opportunities to improve and develop the true potential of your website and also to let go of your chance to expand, focus and develop your business to best meet your target market. There are equally vast numbers of web analytics providers that you can choose from to help you achieve this goal. So far, Google analytics is the largest provider of web analytics out there which offers a vast number of services yet is absolutely free. You can choose from the vast number of providers apart from Google, that you can buy for a basic annual subscription too. Irrespective of the provider you choose for yourself, you need to have the basic idea of the types of information that are available for you. The way your customers behave while they are on your website is referred to as On-site analytics. On-site analytics lets you track how are the users navigating your website, which are the pages that are visited more often than others, are there too many exits after a particular page? How long do visitors stay on your site, how many of these footfalls result into actual conversions or purchases? The ability to focus on every customer individually is one of the most convenient and useful features offered by web analytics. For example, you can track users behaviours and compare the data between the users who actually ended up making a successful purchase as opposed to the ones who didn’t. It can also help you track the difference in behaviours between the users who make substantial purchases versus the ones who make small ones. It must be remembered at all times that your ultimate goal is to make successful sales and conversions and not merely increasing web traffic. On-site analytics therefore helps you track what is working for your website and what is not, to determine what is actually the feature/s that is actually driving in revenue and what aren’t. To understand what your customers are doing while they are on your website, you first need to drive them to your website. You need to use different forms of online advertising, email campaigns, and lot more to lure your audience to your website. Off-site analytics tools will help you track your progress and understand which efforts worked the best for you and which ones didn’t. Understanding the source of your website traffic is vital. The main purpose of web analytics is to find out how much of your traffic is coming from where – for example, whether they are coming via search engine hit, your banner ads, bookmarks, etc. A good analytic tool will provide you with a detailed report of which term lead to the maximum number of footfalls to your website when searched, which advertisement drove the maximum amount of visitors to your website and which social media was responsible for leading the maximum number of clicks on your banner ad. The more organized and efficient your web analytic tool is, the more accurately and quickly it tracks the effectiveness of your marketing campaigns. Even the most basic tools provide you with information that is almost in real time. The most vital part of your marketing strategy are online marketing and mobile marketing. It’s a long established fact that good web analytics can help your marketing strategies in the age where new media channels are evolving rapidly and are fast becoming the need of the hour. Choosing just the right tool that matches your business needs will pay you back in fat money. What is the most important Data? Web analytics makes it easier and possible for you to measure success the way you would measure a projects that has a target of set goals. The amount of footfall is the key and the more traffic you can drive to your website the closer you are to achieving your desired goals. It allows you to measure the success of your online campaigns and the number of footfall falling on your website because of this which ultimately helps you decide which would be the best strategies to adopt for achieving success. Once you learn to measure successfully the failures and successes of your website, and have set your goals, you will be able to identify the best ways to improve your website to help you on the path of successfully achieving those goals. The data provided by your analytics can be used to adapt to the latest technologies by observing the latest trends and gadgets that your visitors are visiting from. It helps you to figure out the best device to target your marketing strategies on by helping you gather information on which devices are you getting maximum traffic through. This will in-turn let you optimize your website according to that device. Your online strategy can have certain bits of analytical data built into them which will allow you to develop and effective marketing strategy. The most important of these should be your site’s referrals that are driving traffic to your website. This will help you to assess where your visitors are coming from apart from the SEO you have, and allows you to understand the impact it has on your website. Once you have this information you can optimize your website by building stronger links, better posts, stronger rapport with external partners and everything else that is affecting the footfall to your website in the most positive way. It can also help you figure out the pages and content that proved to be the most popular so that you can develop a stronger digital strategy with these pages and contents. Web analytics can also tell you which regions give you the maximum number of visitors which in-turn opens up new platforms for you to generate new leads and possibilities for your business. If you could tailor your strategies according to the regional needs of the area, you are looking at a possible market for yourself. What is Google Data Studio ? Google Analytics team released some very exciting news: Google Data Studio will be available to everyone by December 2016! There will still be the robust Data Studio 360 for enterprises, but a standard version will be available to all soon to create beautiful and insightful visualisations. including Ad Words, Big-query, Google Sheets,Data Visualisation, SQL,Google Analytics,Google Tag Manager and others. How Google Data Studio works & advantages of Google Data Studio. The dashboard visualisations are best in class and continually updated from the community. Google Data Studio brings together all your data at one place– from all your data sources – so you can start analysing and visualising it in seconds. For example, you can pull in data from Excel spreadsheets,Google Analytics,Google Adwords,SQL,Ad-Mod, on-premise data sources and SQL databases. In this Digital world Stay on top of opportunities & trends while you’re on the go. Google Data studio is purely hosted in the google cloud, built for the modern, mobile workplace. Easily access your data across all your desktop, tablet and mobile devices. More about Google data studio coming soon! Google Ad-word’s The big change is here, Google has enabled cross-device re-marketing for google signed-in users. Soon advertisers will be able to reach users across devices with Google re-marketing campaigns. Source News : Marketing Land Please visit Marketing Land & Google Adwords Blog for the full article.